When considering the best patio arrangement ideas for your space, it’s easy to get caught up in the “but I’m not a designer” way of thinking. 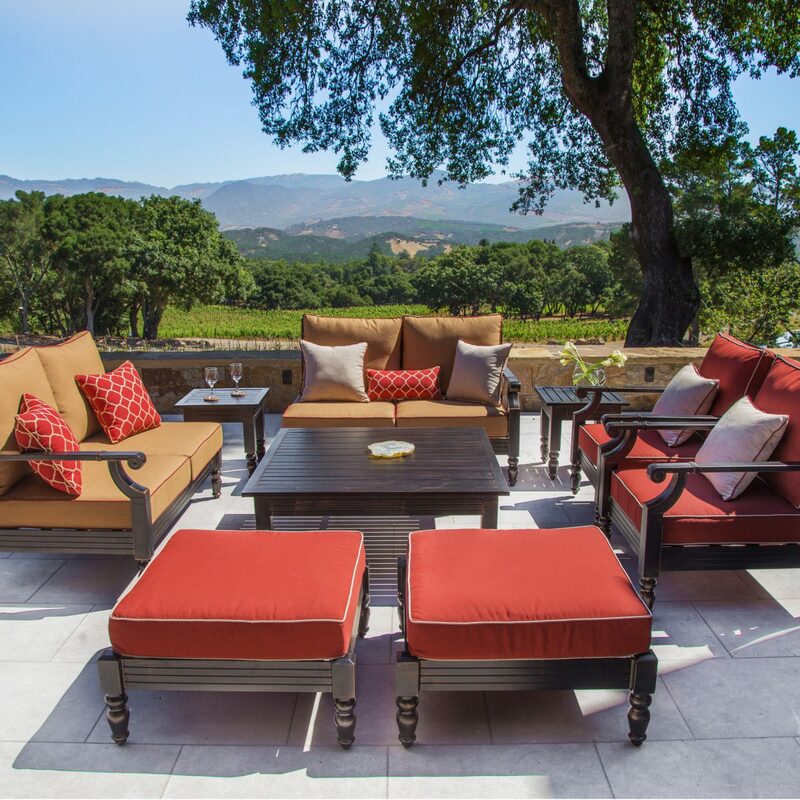 Preparing your deck or patio for hosting and dining simply comes down to a basic understanding of how to arrange patio furniture to best complement your home and lifestyle. Borrow a few tips and tricks from the pros and patio layout ideas will come naturally. So why is patio setup so important? Your deck furniture layout dictates how you and your guests flow throughout the space, utilize the furniture and patio, and even how you view the property itself. It enhances views, inspires a sense of calm and balance and welcomes guests to enjoy an evening of relaxation. 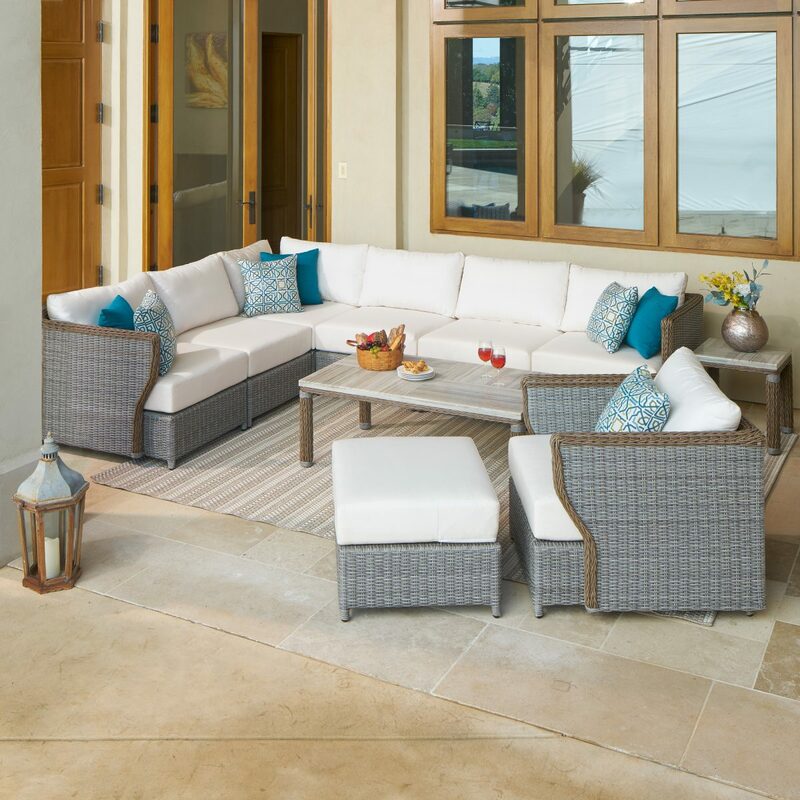 As you begin brainstorming how to arrange patio furniture, begin by traveling through your space for potential hosting areas. 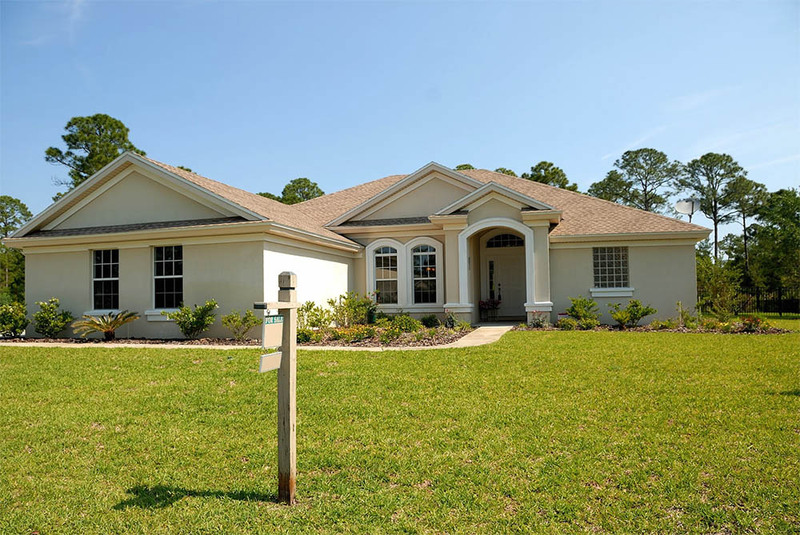 Consider how doors, windows, railings and staircases affect the balance and flow of your area. Next, take a look at the nearby elements. Is there direct sunlight throughout part of the entirety of the day? Would you like to highlight landscape features with your patio furniture layout? Measure your area and either use an online layout tool or draw a basic sketch to scale for your area. This will help you choose which patio set up and pieces work best in your unique area. Patio furniture arrangements should tailor to your needs. If your space primarily acts as a place to host dinners, then consider an outdoor dining set. For more casual relaxing and hosting, a collection of chaise lounges, chairs and side tables may be more appropriate. Even in small spaces, it’s possible to create to separate hosting areas. For example, balance out a dining set with a separate area for gathering around a fire pit. This gives your property a dynamic energy for hosting. Guests can flow from one conversation to the next with this natural separation. 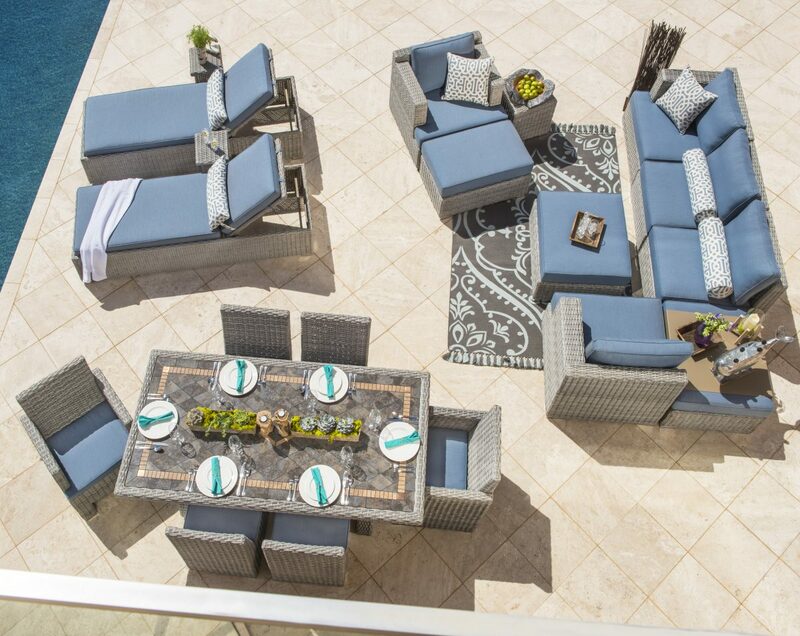 Once you’ve determined the best patio set for your space, consider the arrangement of the pieces themselves. Selecting a focal point further clarifies how to arrange patio furniture no matter the type of space. When seated, what do you hope to showcase? With a stunning view, open up the patio furniture arrangement to face the yard, city view, or landscape. Surround a fire pit or fireplace with a set of chairs and side tables for a cozy feel. 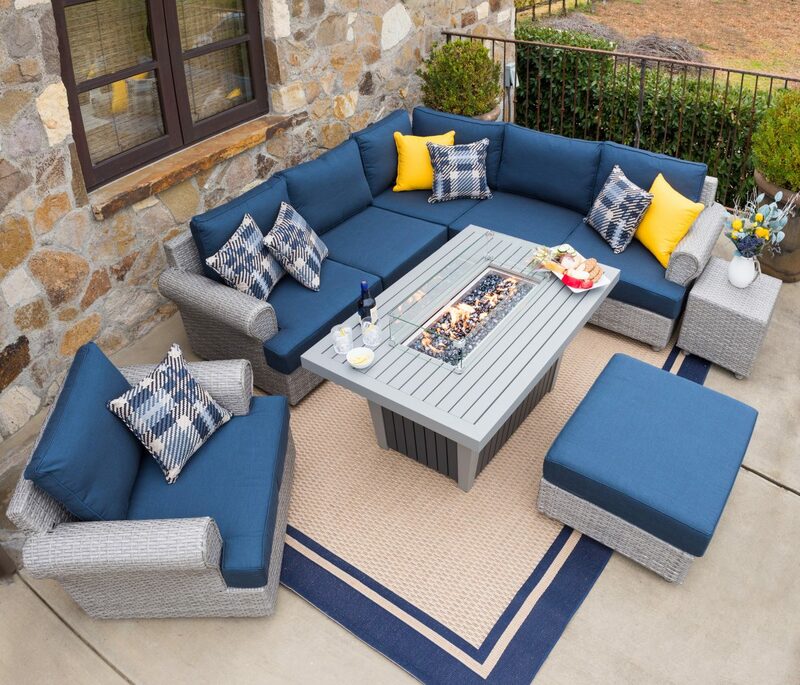 Outdoor lounging and conversation is more casual due to the surroundings, so it’s important to provide a spot on which guests will focus as they lounge. Similar to indoor home layout, how one moves and flows throughout a space should greatly determine how to arrange patio furniture. No matter the size of your space, it’s good practice to make any space feel more open and less cramped. Consider entryways, focal points, plants, and other things that require some sufficient room and a footpath within your space. When placing patio furniture close to a wall, always arrange the longest piece against the wall of the home or enclosed area. This creates length and allows the freedom to move smaller pieces as necessary. Be sure to create a pathway around seating areas. This way, no one can interrupt the conversation by cutting through the center of the area. By creating this extra space around the seating, you also creates the illusion of more room. In dining areas and fireside seating areas, be sure to place your patio set up a safe distance from grills or open flame. Many summer gatherings carry into the evening hours, so don’t forget to make safety an important factor in your layout. 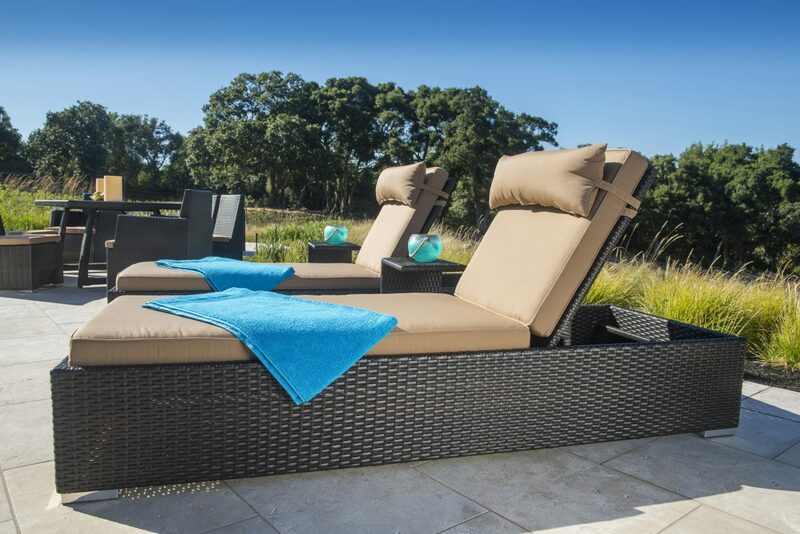 With the variety of patio arrangement ideas available — modular patio furniture, small bistro sets, wicker outdoor furniture — there are endless ways to create a balanced patio furniture arrangement. Furniture settings do not necessarily have to be symmetrical, but it’s good to add smaller pieces across a larger piece to keep the seating area balanced. If you have a larger area to work with, having different entertaining areas with seating options around your entire space can also create a more balanced feel to the overall space. Small decks, balconies, or yards should not limit your design vision when arranging patio furniture. Little details such as adding an indoor/outdoor rug differentiate the hosting space from the rest of the patio. Small bistro sets or three-piece wicker collections are great for reading nooks or having coffee with a friend. Most importantly, accentuate the balance and open space of the area by leaving room for movement in and out of the dining area. Patio furniture layout also incorporates your own sense of style. Once you’ve found the best placement for furniture, add accessories and pops of color that speak to your personality. Greenery and lighting may take up some extra room within your space, so make sure to account for that in the layout. Balance a patio set with comfortable throw pillows, store accessible hosting supplies like wine glasses and mugs, or show off your DIY prowess with bits of art and handmade home goods. Add scented candles and pockets of outdoor lighting for a final warming touch. Consider the range of guests visiting your space, and be sure at least one or two chairs sit in complete shade for particularly hot days. Take advantage of naturally shaded areas in your yard, and/or incorporate awnings, pergolas, umbrellas, or other ways to incorporate shade wherever possible. While a sunny spot is preferable for chilly spring or autumn mornings, it’s always a great idea to have an option of sitting under shade in your space. Overall, find balance in exposure of natural elements. 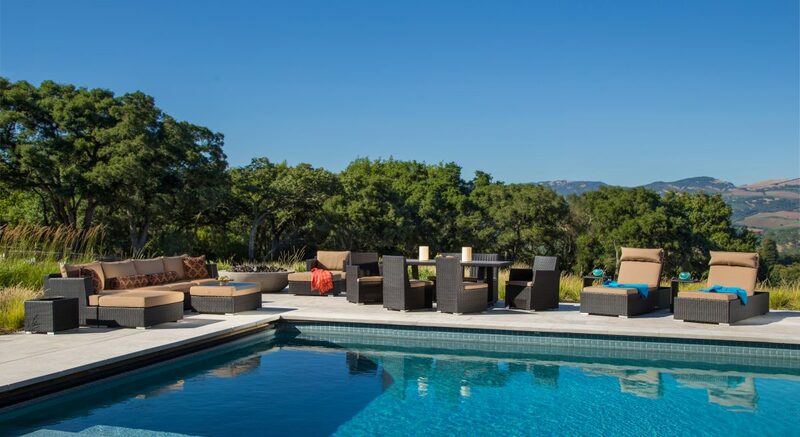 When arranging patio furniture by the pool, modular or easily movable pieces often work best. Poolside lounging often shifts from individual sun bathing to group cocktails throughout one afternoon party, so it should be easy to shift when necessary. 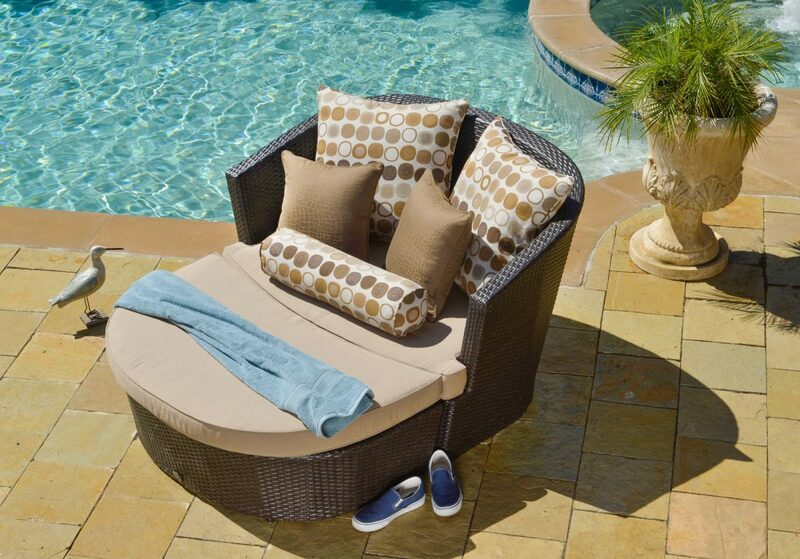 Create small pockets of seating safely around the corners of the pool, or designate the dining and seating to one side. As with the fire pit arrangement, remember to leave a safe amount of space for travel both in day and night. Proper lighting completes any patio area. Serving both for safety and style, touches of outdoor lighting add balance, deter bugs from guests, and add a warm glow to summer gatherings. It’s important to make sure high traffic areas such as dim walk ways and doorways are well lit, and that larger dining areas have sufficient lighting. Cozier seating near firepits or areas with conversation sets may call for more relaxed lighting. Make room for free standing lamps if needed, and when hardware additions are not an option, add a collection of candles to your outdoor dining or side table. Arranging your outdoor patio furniture is all about melding your sense of style with a few basic design rules. Creating an open space with good flow, or at least the illusion that your space is more open than it really is, is the best tip on how to arrange patio furniture within your space. Whether you’re creating a layout in a cozy space or designing furniture for an expansive yard, these simple tips can help you create a haven for hosting and relaxation.